Lent is the Church’s season of penitence and reflection which lasts for the forty days (other than Sundays) from Ash Wednesday until Easter. It is a time when many Christians do something extra to show their faith in action, in readiness for our worthy celebration of Jesus’s Resurrection at Easter. At St Mary’s the observance of Lent includes prayer, reading, discussion and fellowship in small groups meeting both in church and in people’s homes. Lent also provides an opportunity for self-denial – giving up some of the comforts which we so easily take for granted most of the time, and learning to appreciate them all the more when the time of fasting is over. At St Mary’s, as elsewhere, part of this process of self-denial is the veiling of colourful pictures and ornaments in the church, so that a simpler, more austere mood is created (most strikingly by veiling the great Rood that rises above the Chancel steps). Their temporary absence from view provides a more solemn seasonal setting for our worship, whilst the symbols superimposed on many of the hangings help to focus our thoughts on Our Lord’s passion and death and what these might mean for us today. The lecterns and pulpit, the high altar and the chapel altar – as we cannot fail to notice at key points of the Ministry of both Word and Sacrament – are similarly provided with Lenten hangings. All the hangings, collectively known as the ‘Lenten array’, are made of plain unbleached linen. On to this have been painted or stencilled symbols representing Our Lord himself (the chi-rho, left, one of the earliest Christian symbols formed from the first two Greek letters of the word for Christ), or reminding us of his Passion, or in a few cases representing the saint whose picture or statue is behind the veil, as in the sword covering the statue of St Paul at the west end of the church, or the spiked wheel covering the painting of St Catherine in the Chapel of the Holy Spirit. The elaborately painted and sculpted triptych of the reredos behind the high altar is kept closed during Lent. On its doors we see only words calling us to remember our sins in penitence: Return to the Lord for he is gracious and merciful. The earliest reference to the use of Lenten veils at St Mary’s is in 1902, just after the arrival of Percy Dearmer as vicar. 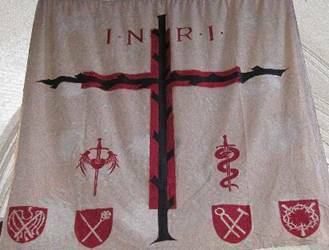 A new set was donated in 1915, which included the Passiontide frontal for the high altar, still in use (see below). It was designed by EE Dorling and painted by the Misses Burgess. Veiling of the great Rood (erected in 1915) was not attempted until 1920, when a large sheet of plain linen, then bearing only a simple red cross, was hoisted into position using a system of pulleys and ropes. An archive photograph of the 1930s shows its original appearance. The design reached its present form in the 1940s, after over-painting with the letters INRI (standing for the Latin inscription on Jesus’s Cross: Jesus of Nazareth, the King of the Jews) together with many symbols of the Passion. Most significantly, the red cross is now overpainted with a Tree of Life, its shoots and branches pruned ready for new growth. The hanging, though still in annual use, is now rather fragile. In the medieval church it was common from at least the 15th century for symbols representing every stage of the Passion story to be depicted not only on vestments, altar hangings, sacred vessels and ornaments, but also in more permanent features of the building including stained glass, floor tiles, and carved and sculpted decorations. Quite often the stone or wooden angels of the ‘angel roofs’ in our ancient churches carry shields with passion symbols. Much of this decoration was deliberately destroyed at the Reformation, when churches and their ceremonial became generally plainer, though the symbols can still be seen by the observant visitor in many churches. With the revival of interest in the English church’s pre-Reformation heritage in the 19th century, passion symbols gradually came back into favour. The veil for the great Rood with symbols of the Passion along the bottom, from the left: the scourges with which Jesus was whipped; the sword that pierced his side and the sponge on a stick with which he was given vinegar to drink; the hammer and pincers used for making the Cross and attaching and detaching its Victim; the crown of thorns placed in mockery on Jesus’s head and the nails with which he was attached to the cross. Above are two more complex symbols: a winged heart pierced by a sword, in front of the figure of Our Lady and reminding us of Simeon’s words, ‘and a sword shall pierce your own soul also’; and a serpent entwined round a sword, in front of the figure of St John but also suggesting Jesus’s victory over Sin and Death. Top row: money bags representing the 30 pieces of silver for which Jesus was betrayed by Judas Iscariot; the pillar to which Jesus was tied and the rope used to bind him; whips and scourges; crown of thorns and nails. Centre row: the letters IHS which are the first three letters in Greek of the name Jesus; the Five Wounds of Christ, showing pierced hands, feet and heart; the chi-rho (XP). Bottom row: coat and dice; Cross, spear, reed and sponge; the ladder for erecting the Cross and its Victim; hammer and pincers. Almighty and everlasting God, who in your tender love towards the human race sent your Son our Saviour Jesus Christ to take upon him our flesh and to suffer death upon the cross: grant that we may follow the example of his patience and humility, through Jesus Christ your Son our Lord, who is alive and reigns with you, in the unity of the Holy Spirit, one God, now and for ever.